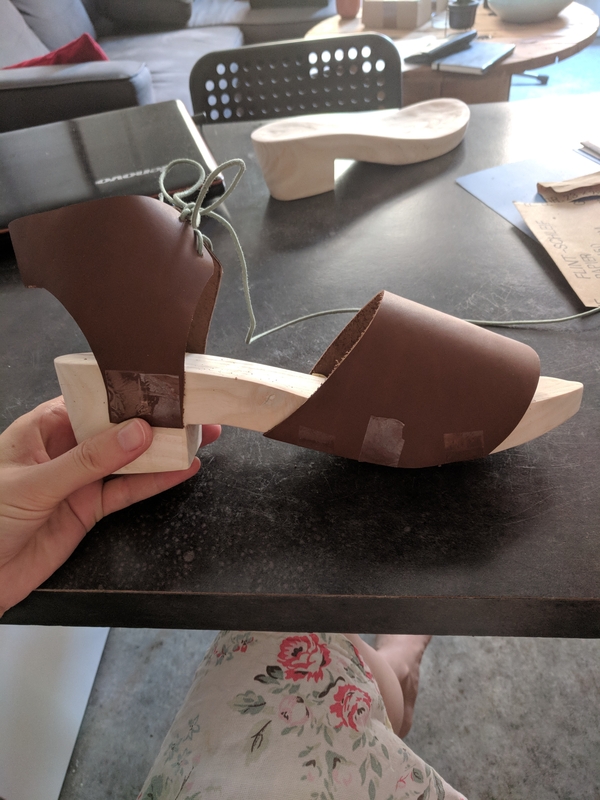 So, I hope you are prepared for a long blog post; the tale of these handmade clogs is a long one, spanning two summers and many hours of work. For anyone not interested in the long version, here as short summary: it’s been an interesting ride. I learned a ton and, despite my amateurism, ended up with a pair of clogs that are pretty and wearable, which is a great win. 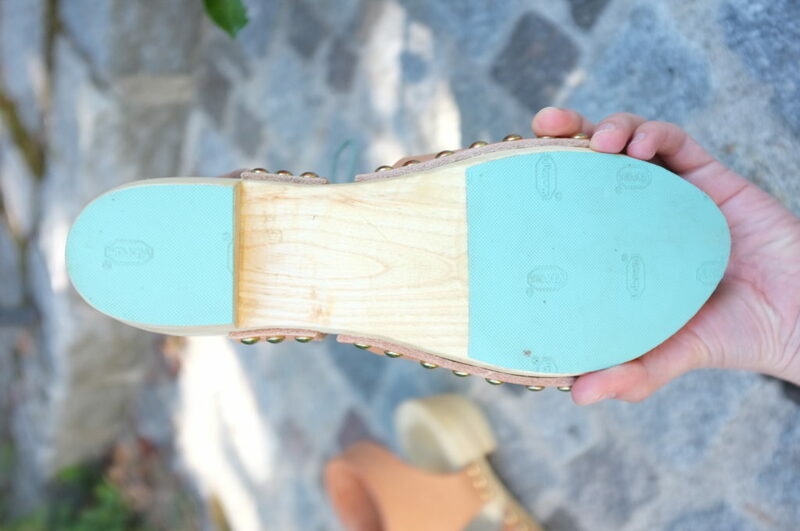 I especially loved seeing the wooden soles form, from a tree branch, to actual shoes, so cool! These clogs were the final piece of my Summer of Basics wardrobe. Check out the photos at the end of the post for the full look. 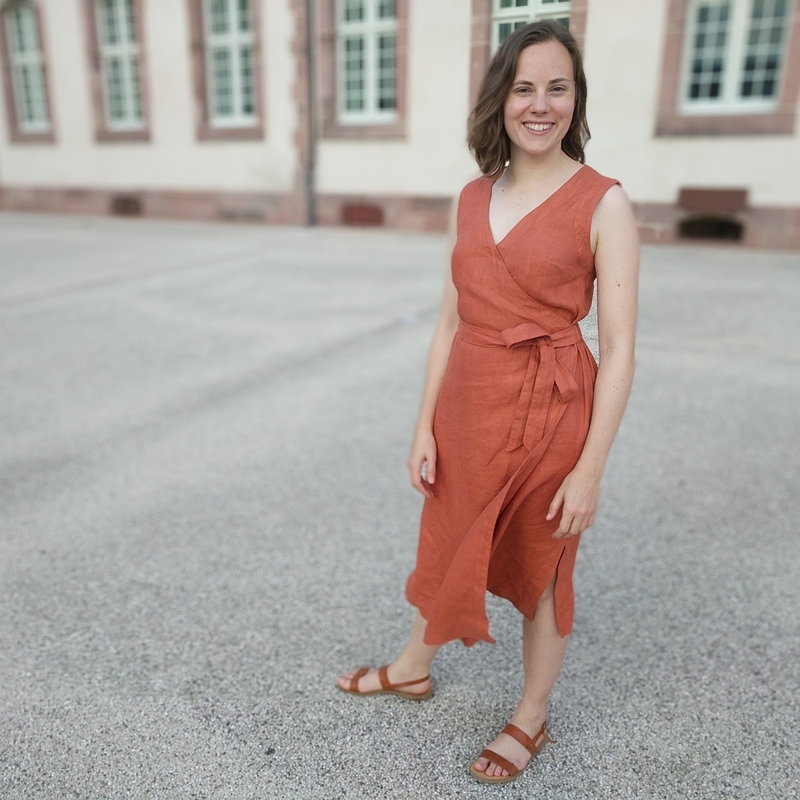 When my husband and I were planning our wedding (which was in spring 2017) I set out to find some shoes to go with my hand-made dress (here is the blog post about the dress if you are interested). I was willing to splurge on a nice pair of shoes but after days of searching the internet I just couldn’t find anything that I was excited by. 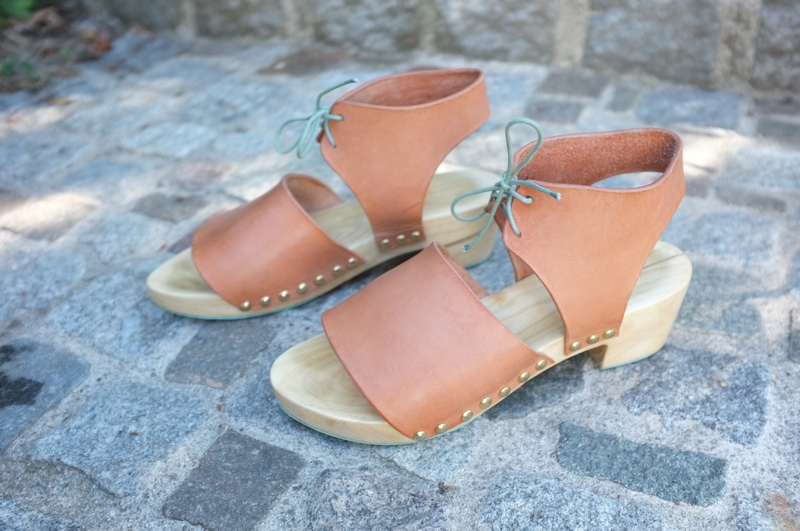 The only shoes that I found inspiring were Bryr Clogs. And while I think the prices are justified for such stunning clogs, I wasn’t ready to pay that much for a pair of shoes, in particular because I didn’t know if they would really go with my existing wardrobe. I’m very keen on getting a lot of wear out of my shoes, investment pieces especially. So in the end I decided to not buy them and instead got a pair of comfortable berry coloured heels from Clarks, which did the job perfectly. 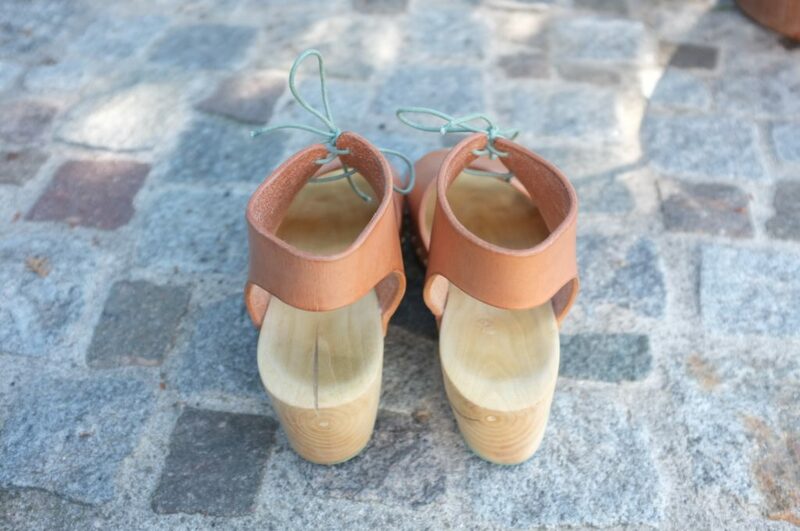 Nevertheless, the idea of a pair of wooden clogs didn’t leave my mind and I began researching whether I could make my own. 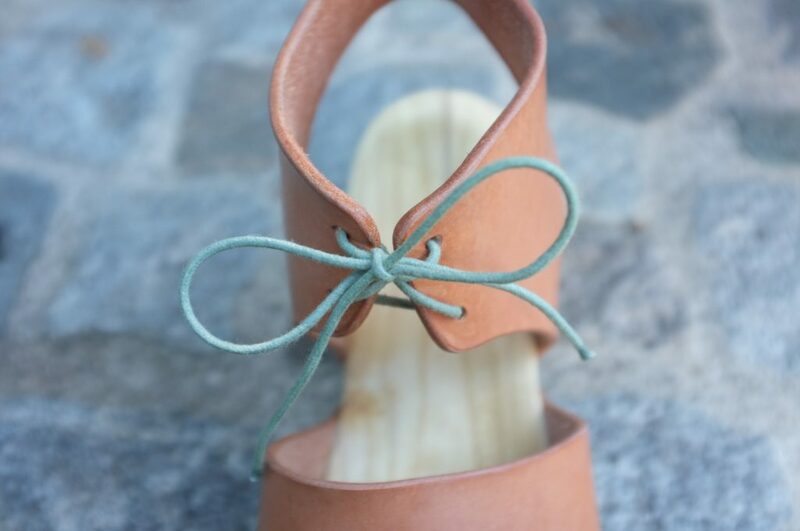 There are a few sewing bloggers that have ventured into shoe making and I love following along with their adventures (for example Jasika, Carolyn, Marilla). First I researched whether it was possible to buy wooden soles to make my own pair. I struggled finding any good sellers, so I decided to make my own (inspired by Carolyn). 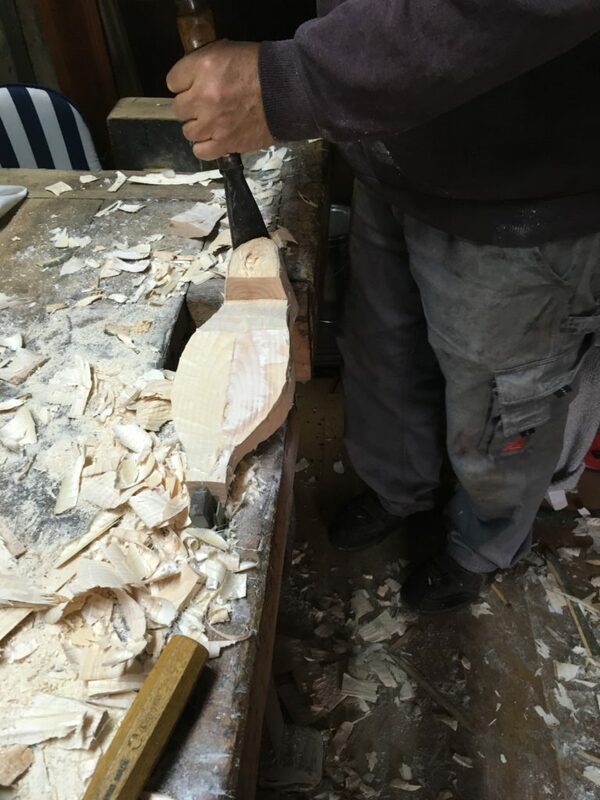 I was especially encouraged by a video of a British clog maker who made it look so easy. Even if you are not interested in making your own clogs, this video series is very interesting to watch. Then I called my parents to see if we had the wood and tools to make a pair. My father immediately was super supportive and so last summer we started the adventure of clog making. 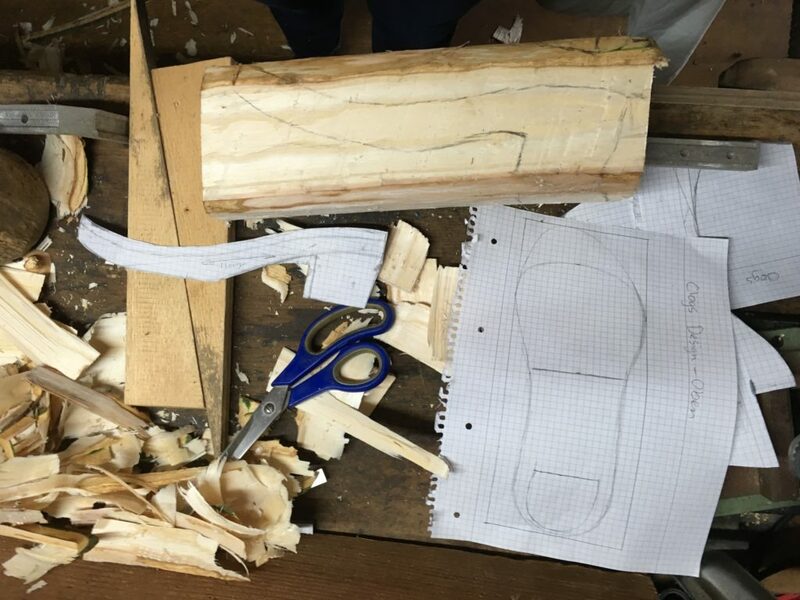 Disclaimer: I am not a clog making or shoe making expert or an orthopaedist, so this is not so much a “how-to” rather than a description of my experiences and the lessons learned. In the video the clog maker is using green i.e. freshly cut wood, so that’s what we decided to work with. 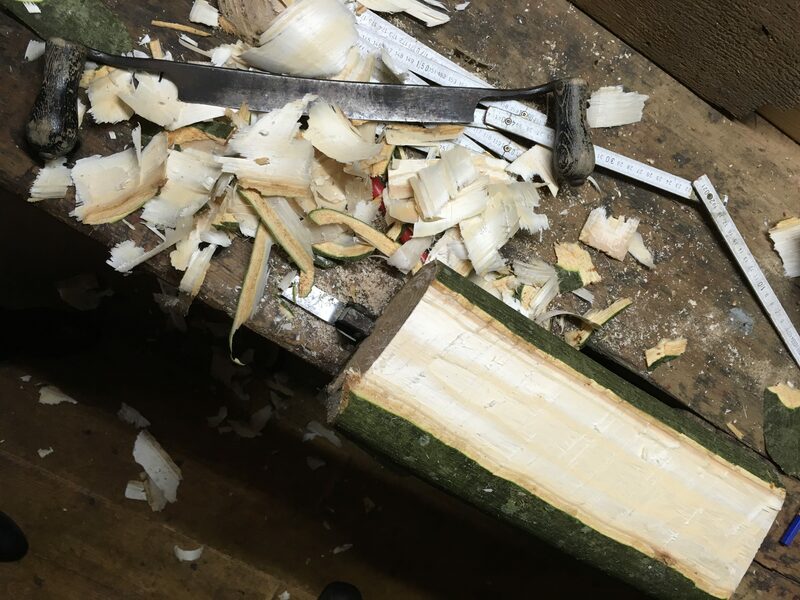 First step, get a branch of suitable wood. 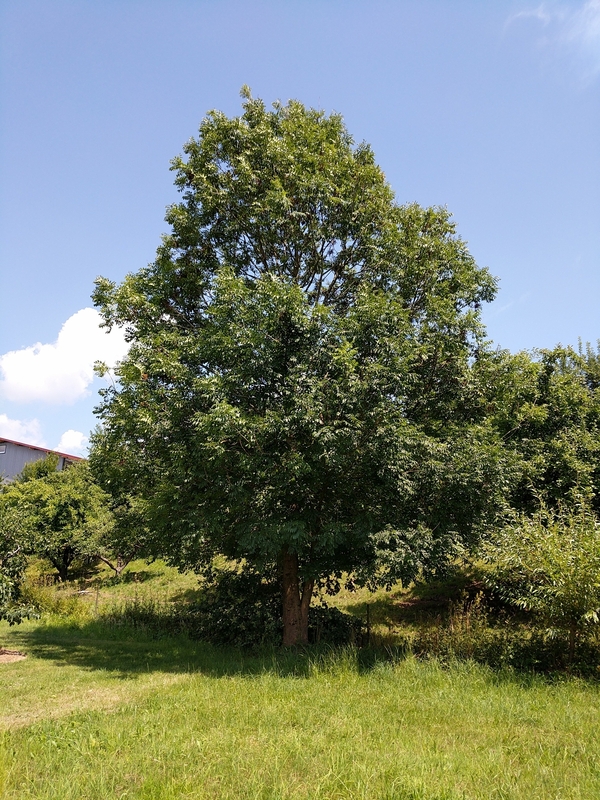 Conveniently we have a big ash tree, so we climbed up there and sawed off a branch that looked large enough. I did do some of the sawing (I wish I had photos) but my dad definitely helped with the biggest piece. The branch we then cut into two pieces to accommodate a sole each. 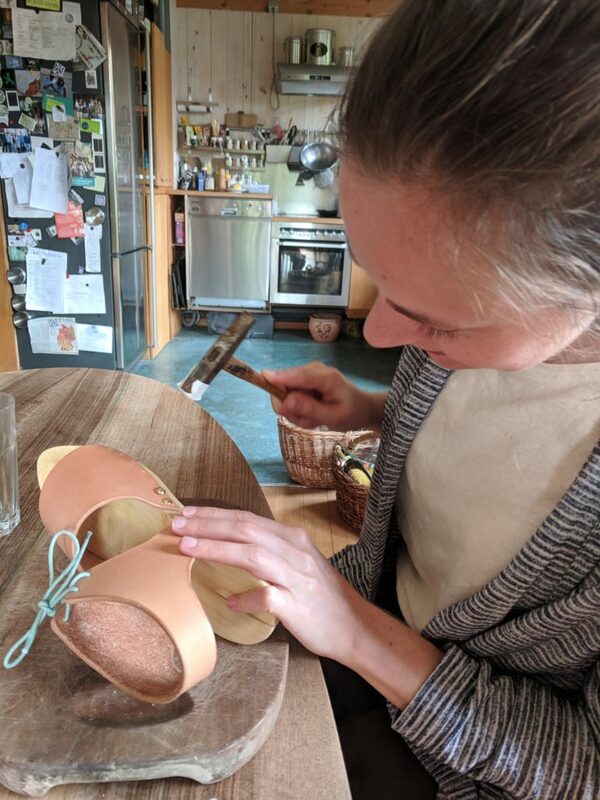 Unfortunately three dimensional soles use up a lot of space so we only just managed to squeeze them out, having to slightly go though the centre of the branch, a wood working faux pas, as my sister (a trained wood carver) pointed out. Still we forged ahead expecting that the wood might split in some places when drying up. 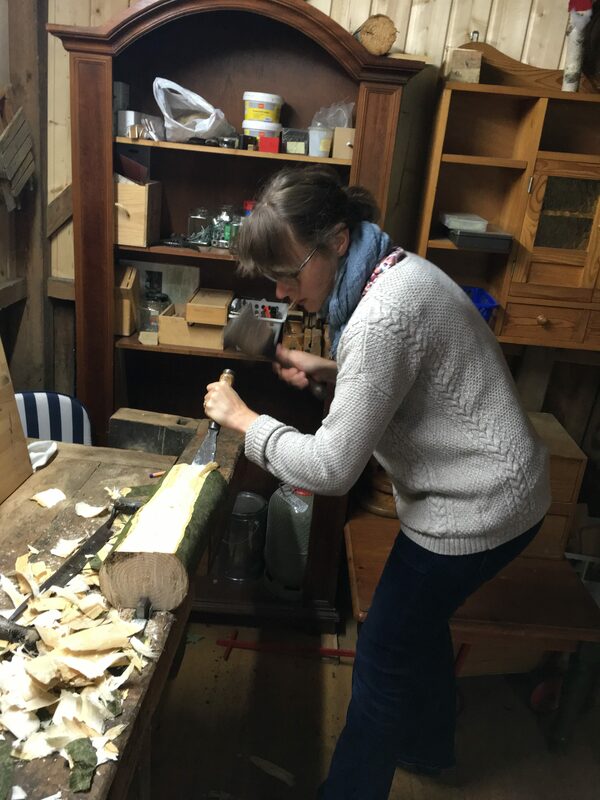 First we peeled off the tree bark (the most satisfying step) and then cut the piece into a rough cuboid shape. Then I transferred the design of the soles onto the different sides (i.e. top and side view). 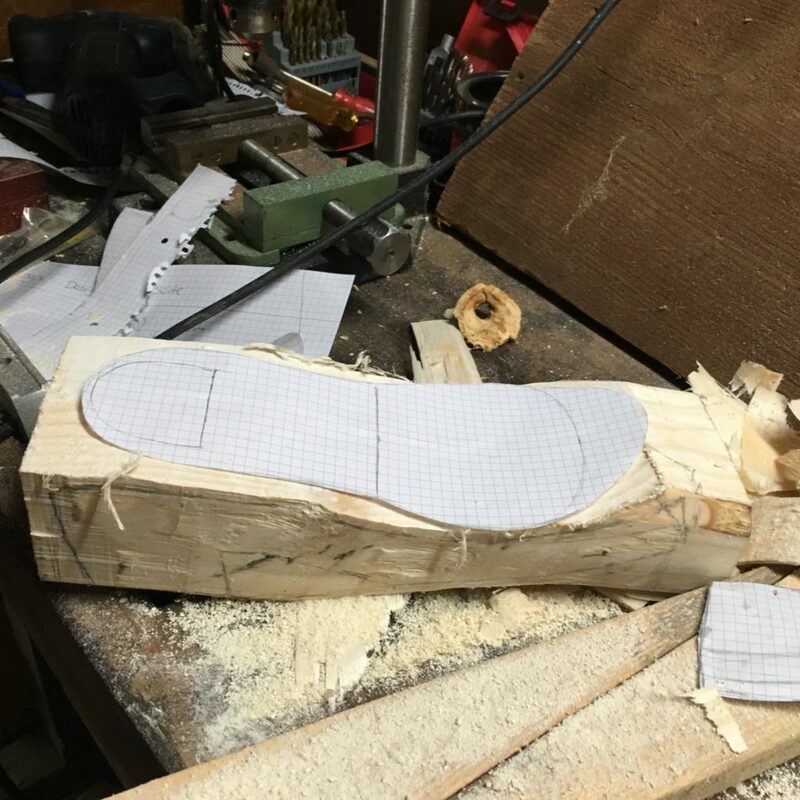 The foot bed shape was based on an existing pair of flat sandals, which I transferred over taking the distortion through the heel into account. 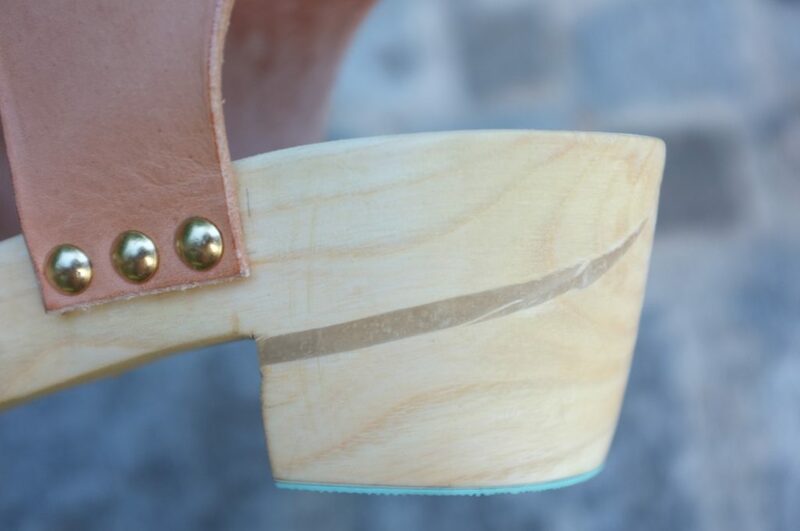 The heel height was mainly determined by the size of the wood block. 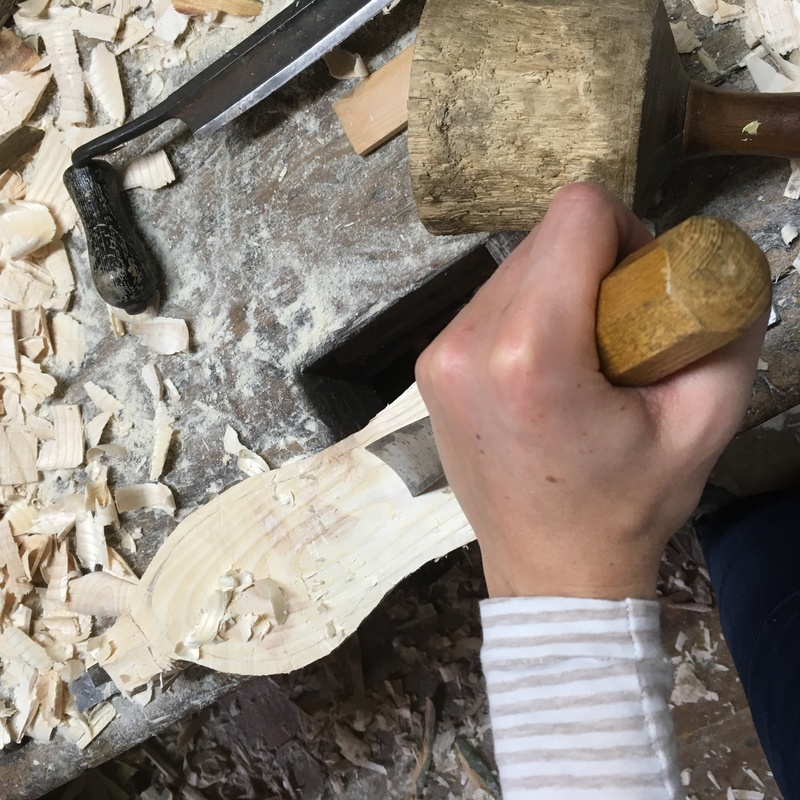 Then we shaped the soles mainly using chisels and a jigsaw, which was a good amount of work, but I learned so much about working with wood. The biggest challenge of it all was to make the two soles back-to-front symmetrical to each other, which is quite a task with free-hand wood working. 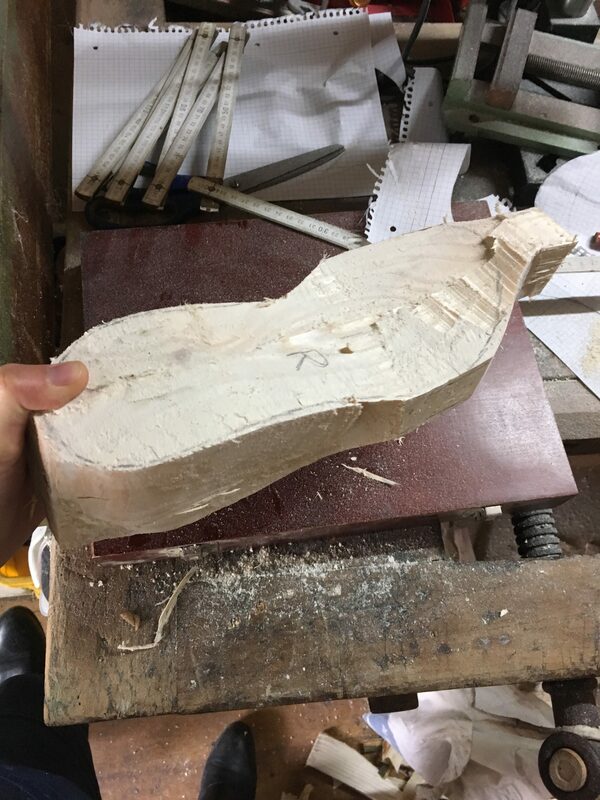 For better comfort I also chiselled a slight foot bed into the sole. 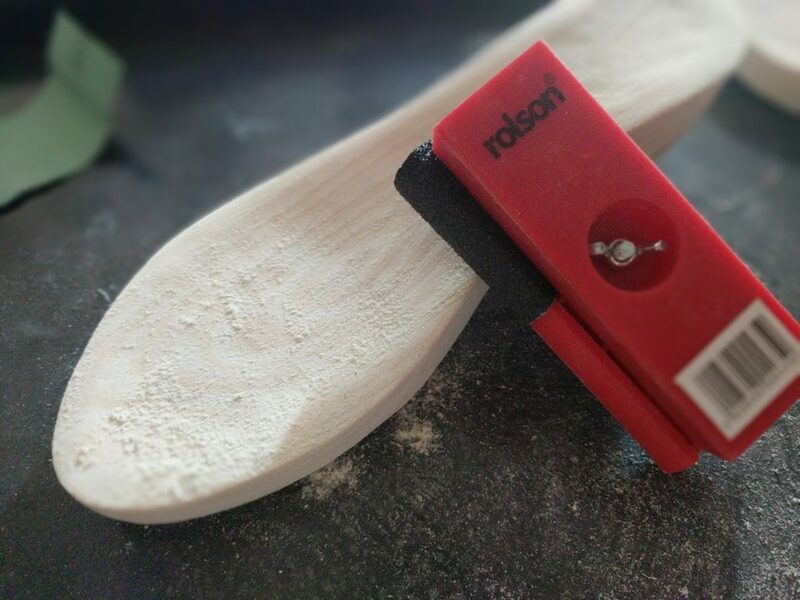 Once the soles had their rough shape I moved on to the sanding. 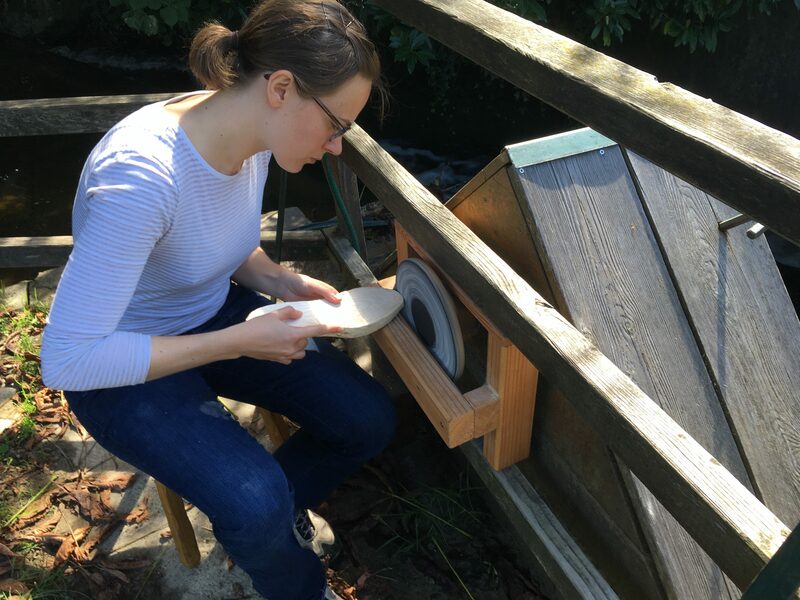 The rough sanding was done on a grinding wheel attached to our water wheel (one of my fathers projects from a few years ago). This process was a lot of fun and helped getting the round shapes at the toe, heel and helped even out the bottom of the soles. Then I let the soles sit for a few days and as expected they both split slightly at the heel. Since I had started the project at the end of the summer I thus decided to let them dry out over the winter and finish them the following year. This summer came around and I knew I needed a deadline to finally finish them, so I decided to put them on my Summer of Basics list. I’m so glad I did as it gave me the push to finish all the hand-sanding they still needed. The splits that appeared through the drying process were filled with some epoxy glue, which actually gives a very cool effect (I’m all about embracing the flaws instead of covering them up). 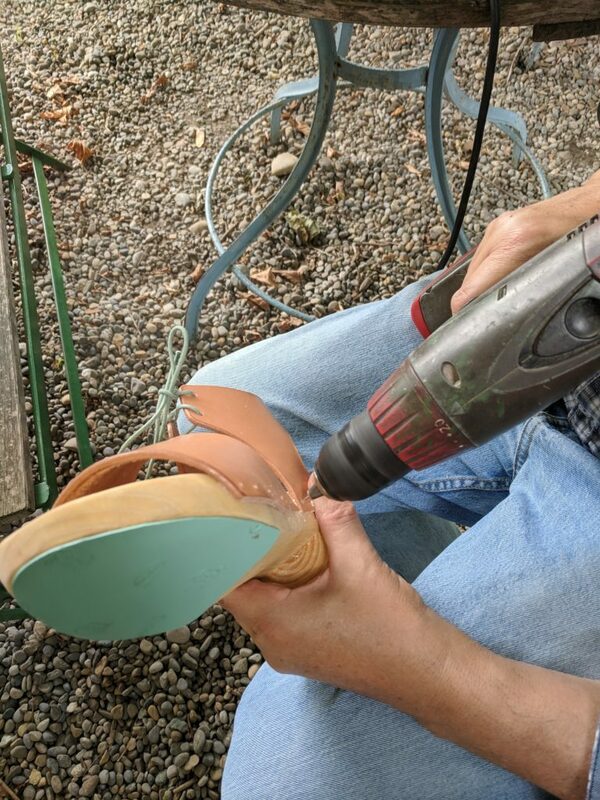 I also took them to my brother’s work to get the bottom of the soles evened out on a belt grinder to make sure I could stand and walk securely in them without tilting. Finally I treated the wood with some hardwax oil. For grip and to avoid walking directly on the wood I glued some Vibram rubber soles onto the bottom in a fun teal colour. 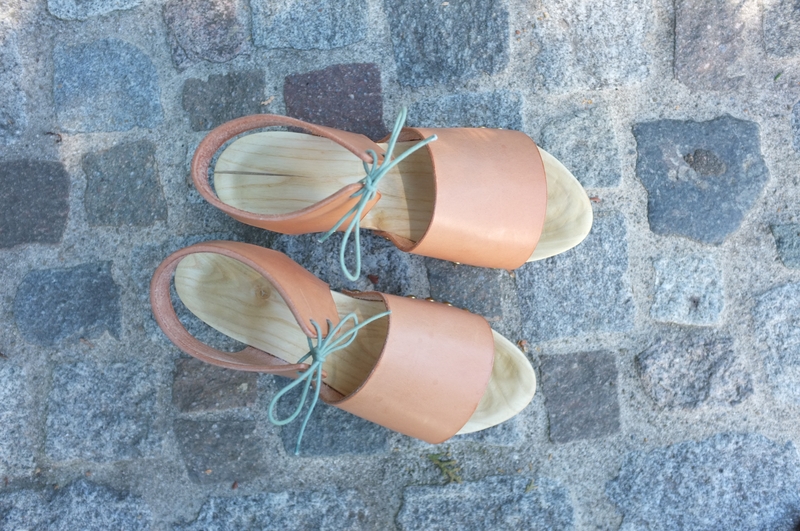 I had already ordered some 3 mm natural veg tan leather off ebay last year to use for these clogs. 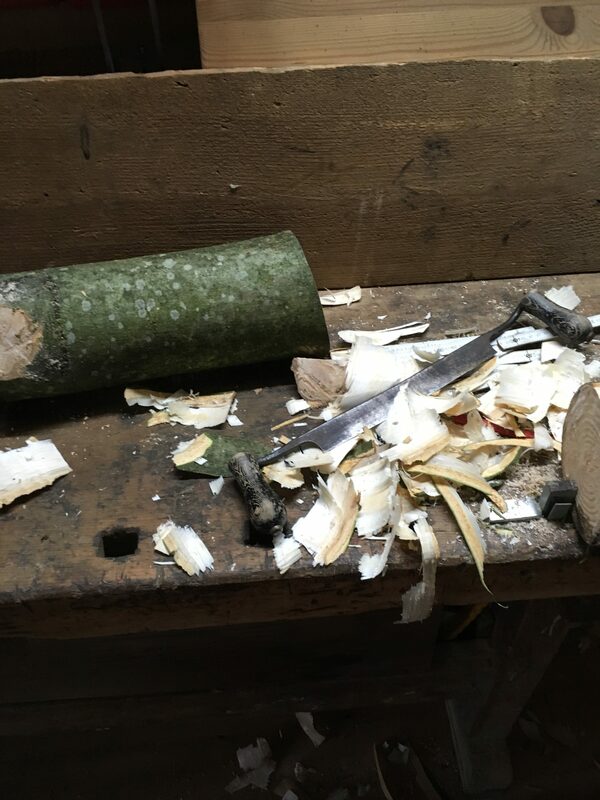 Conveniently, my husband and I have taken up leather working over the last year, so we now have all the tools and knowledge to properly process leather. Design-wise I was of course heavily inspired by the Bryr’s clogs and decided to go for a simple design that wouldn’t require a shoe last. I made prototypes of the shapes first from felt and then some cheap chrome tanned leather and played around until I way happy with the fit. 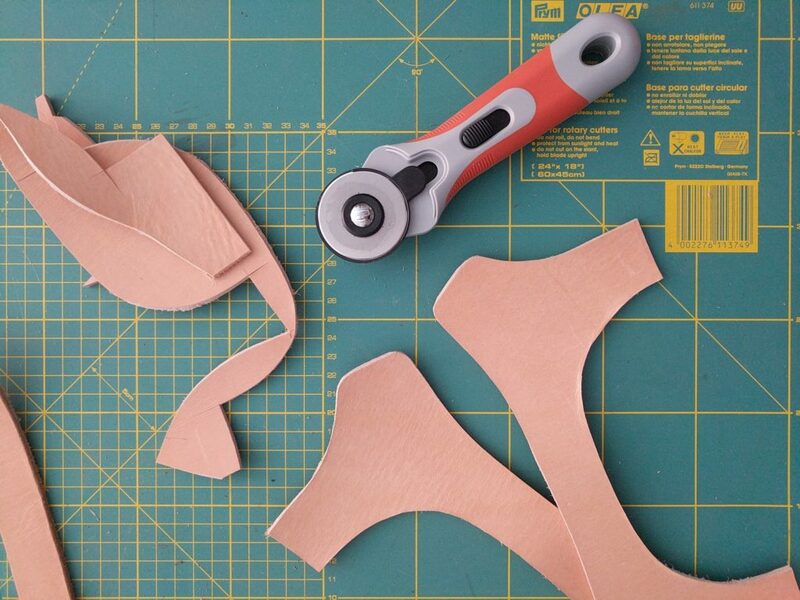 Then I cut the pieces from the natural veg tan leather, thinned them out in the places where the leather would be attached to the wood and finished the edges by burnishing them with water. 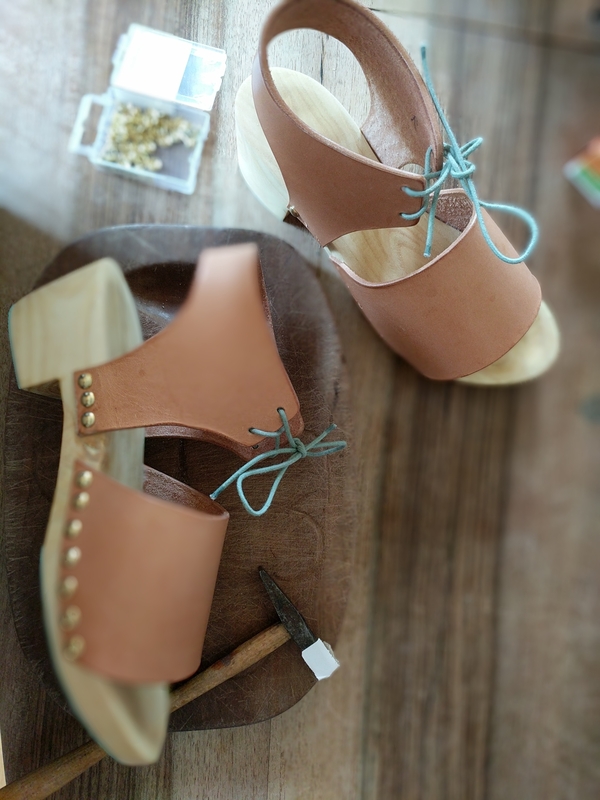 Finally it came to attaching the leather to the wooden soles with simple furniture nails (8mm). Unfortunately the wood was too hard to just hammer them in, so we first had to drill some holes. I attached the leather first with some glue to keep everything in place and then hammered the nails in with a little hammer covered in duct tape to avoid damaging the nails. This was such a satisfying task and I love the gold nails against the light wood and the leather. For the closure I went the easy route and just punched some holes to thread a piece of cotton cord through, in the same colour as the soles. Since the leather is natural it is very sensitive to any fat or water. I did treat it with some oil and leather soap to avoid it getting stains too easily but overall I want to embrace the natural nature of the leather and am looking forward to seeing how it will naturally darken over time. Since natural veg tan leather is malleable when wet, I dipped the final sandals in warm water and wore them half a day letting them dry out. That way they are now formed to my foot which makes them more comfortable to wear. So what about the final clogs? Of course they are not perfect. 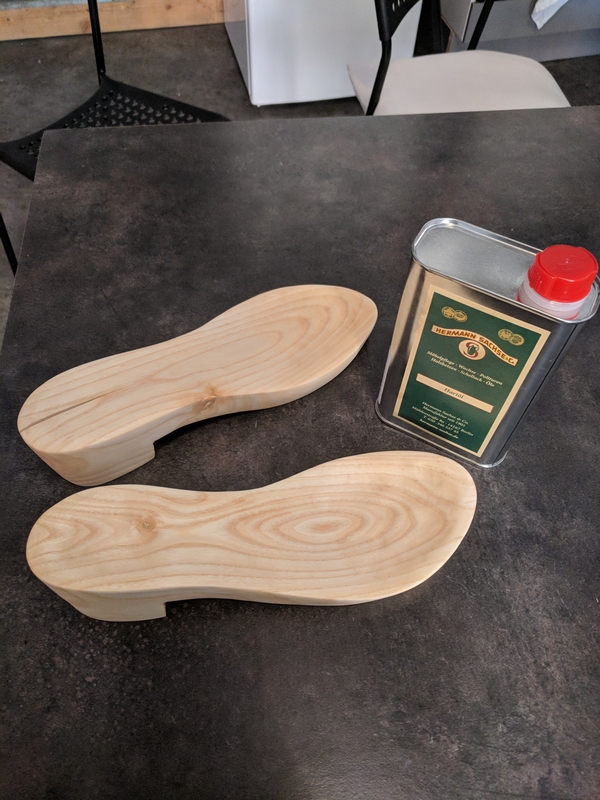 I mean this was my very first time making wooden soles or using leather for shoes. The soles are not 100% symmetrical and from an orthopaedic perspective potentially not to recommended for long walks. Then again I am surprised that they actually work and when wearing them I don’t feel any differences between left and right. I will need to learn to walk on clogs as they behave completely differently to other shoes due to the stiffness of the soles. I read online that it can take 2 days to 2 weeks practice to learn how to walk on clogs properly. I’m only half-way there and am still stomping more loudly than I would want to :). Overall though I can imagine wearing them quite a bit. And even if I don’t wear them to death, this was such a fun adventure and I learned so much! 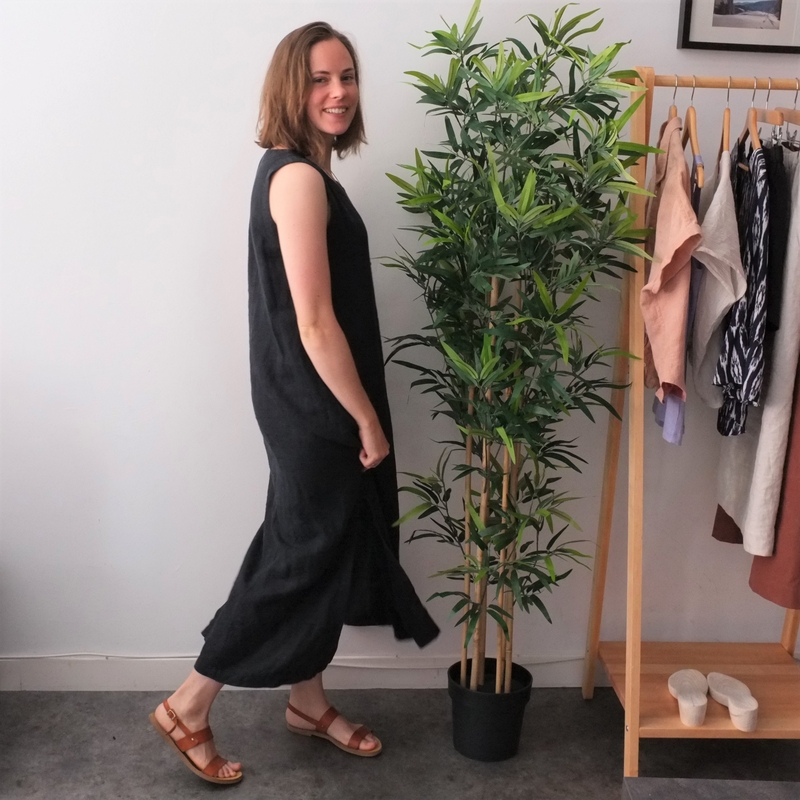 It’s such a satisfying experience to see a piece of clothing form from the origin (a tree!) to the final product. Also it was really lovely to work on this little summer project together with my father. 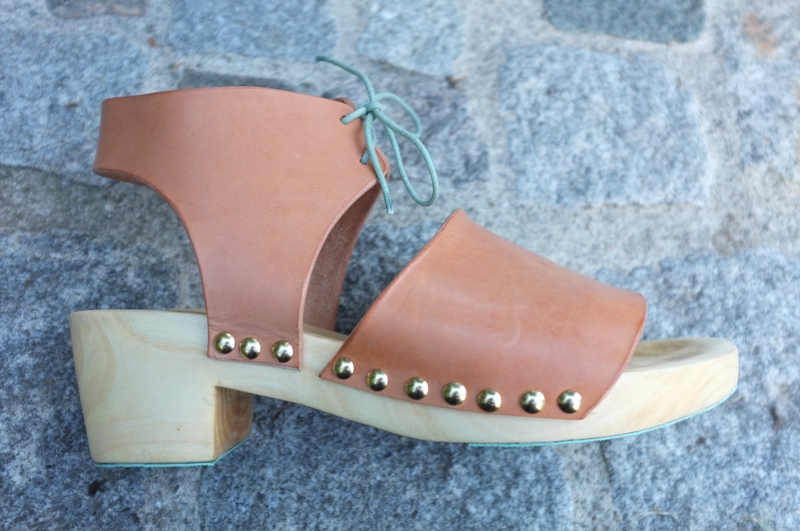 As I said, these clogs were the final piece of my 3-piece Summer of Basics outfit. They go great with the Persephone Pants and the Tello Jacket. All in all, an outfit I can see myself wearing a lot. This year again I had a lot of fun joining this challenge and I loved seeing what everyone else came up with! While this dress is not intended to be reversible, it had the perfect features, a wrap v-neck and a boat neck. 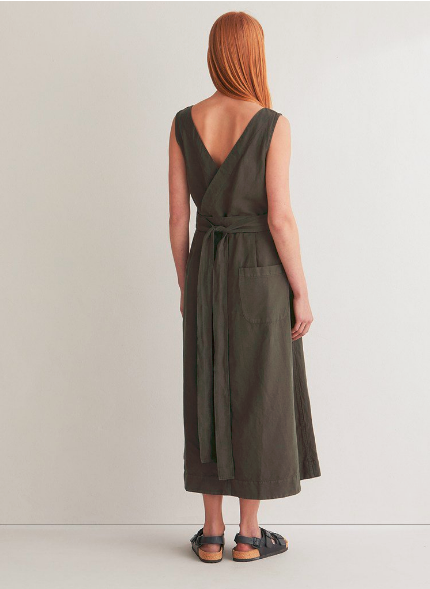 So what better pattern to choose as a base than the Allie Olson Highlands Wrap Dress? Since I have made it twice before I knew I liked the fit of the wrap front. What then followed was a not-so-scientific approach to amending the pattern. First, I tried on my orange linen wrap dress with the v-neck to the back. Sure the neck was way too high but it gave me a fairly good idea of how much I had to lower the neckline, where to move the shoulder seam and how much width I needed to add at the side seam. Once I had settled on the major changes needed, I cut out the bodice pieces ignoring any darts. In the original pattern the front bodice pieces don’t have any waist seam so I cut them off at the same level has the back piece and just worked on fitting the bodice. Through a lot of try-ons, playing around with the side seam and the armscye, I managed to get a surprisingly good fit. It definitely helps to not have a big bust otherwise the fitting would have been more problematic. Happy with the bodice, I added a waistband, mainly because the bodice ended too high. Then I tested how it would look with an elastic threaded all around through the waistband. While the elastic waistband is one of my favourite features on the original dress, it didn’t work in this case due to the bulk of the wrap. So I scrapped that idea and decided to only use ties for waist definition. For the skirt I wanted to try a new shape for me. 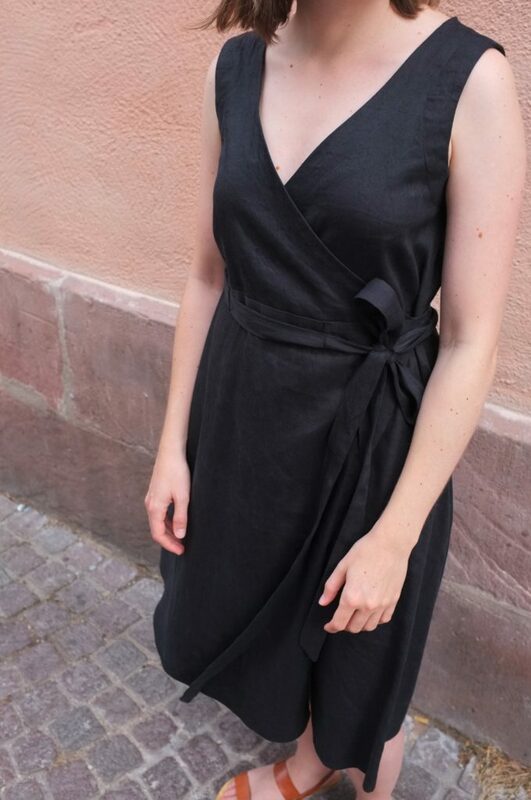 Instead of the straight skirt of the Highlands Wrap Dress, I drafted a slight A-line skirt, similar to the inspiration dress. To ensure that I was able to tie them in the front or the back, regardless of which way around I was wearing the dress, I made the ties super long. 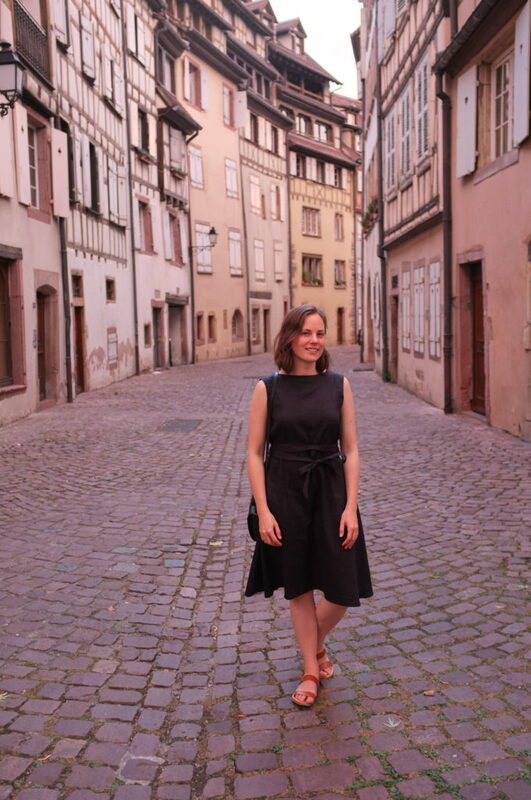 The dress is closed with two teal buttons, one at each side, which I found at a local haberdashery here in Colmar. So what about the final dress? I’m really happy with how well it works as a reversible dress. Both sides are completely wearable. The v-neck wrap is slightly lower on this version than the Highlands dress, since I moved the shoulder seam. However, it is still decent worn this way around. My favourite way to wear it is with the boat neck in the front. That way it’s a classic little black dress from the front, with a little bit more interest in the back through the deep v.
If I make this again, the one thing I would change is to remove the waistband and cut bodice and skirt as one piece or lower the waist seam and attach the skirt directly to the bodice. As it is, the waist is a little bit bulky and I have to be careful with how I wrap the ties, so that the waistband doesn’t peek out. All in all though, it was a very successful experiment. I feel quite chic in my (first ever) little black dress. The dress had it’s first outing for a dinner at a Michelin star restaurant here on the wine route a couple of weeks ago (a present for my husband for his 30th from my parents). 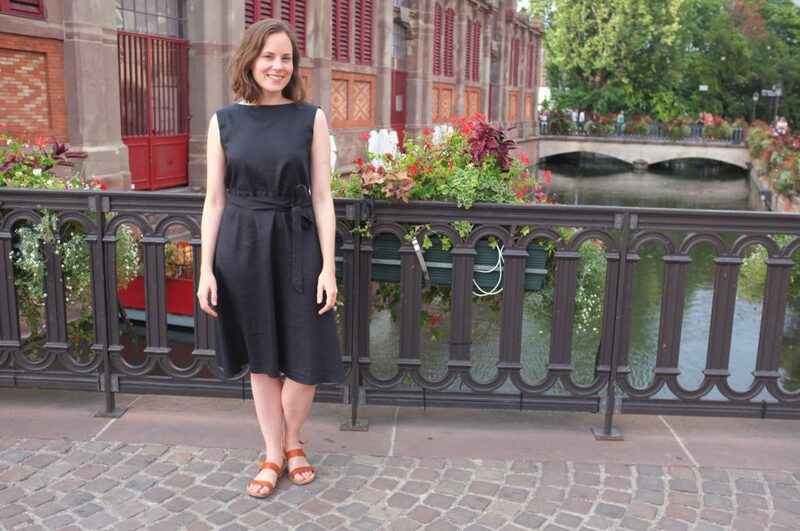 The photos were taken this week when I wore it for a dinner out, here in Colmar. 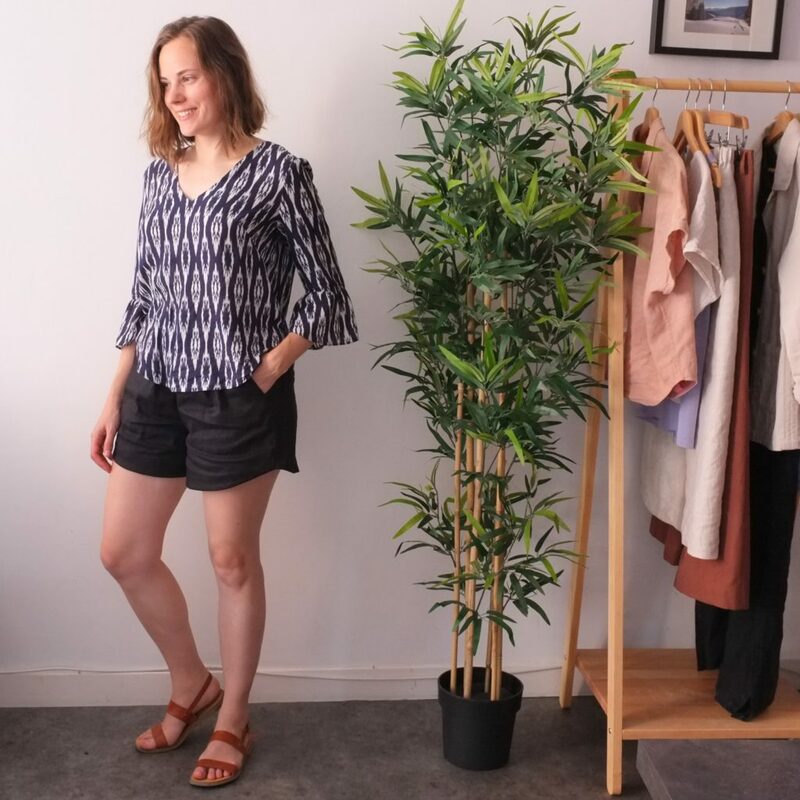 So the Summer 10×10 Challenge is over and I thought I’d quickly run you through my outfits and the lessons learned. First of all I loved choosing and wearing my 10 pieces. It was surprisingly easy to stick to them, and there are even more outfit combinations I want to try. 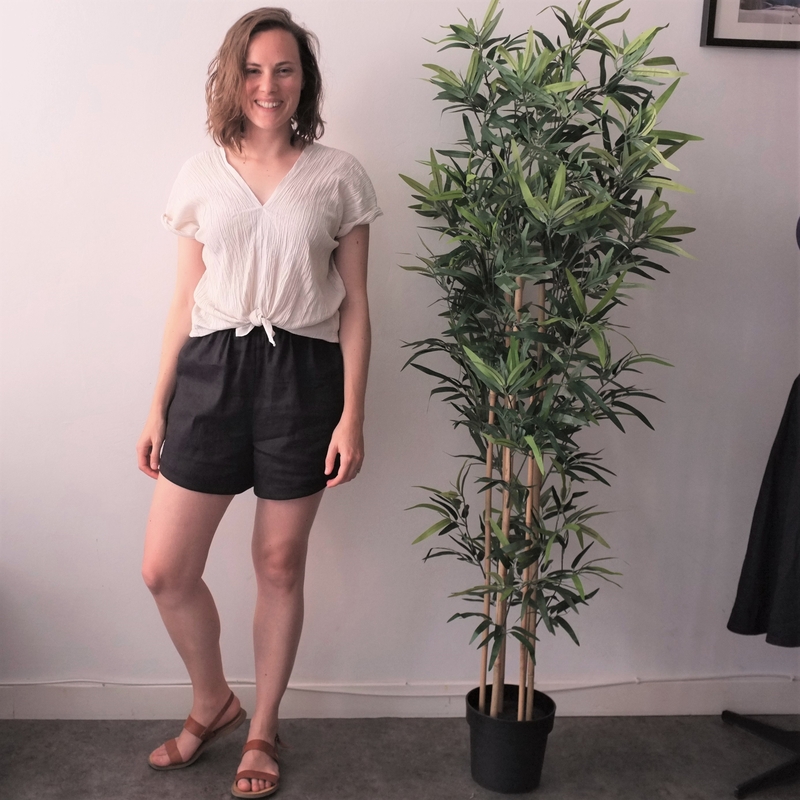 Day 1: black linen Peppermint Magazine Spring Shorts (a free pattern!) and self-drafted cheesecloth top (both unblogged) for a quiet day staying in. It’s the perfect outfit for the crazy hot weather we’ve been having lately. 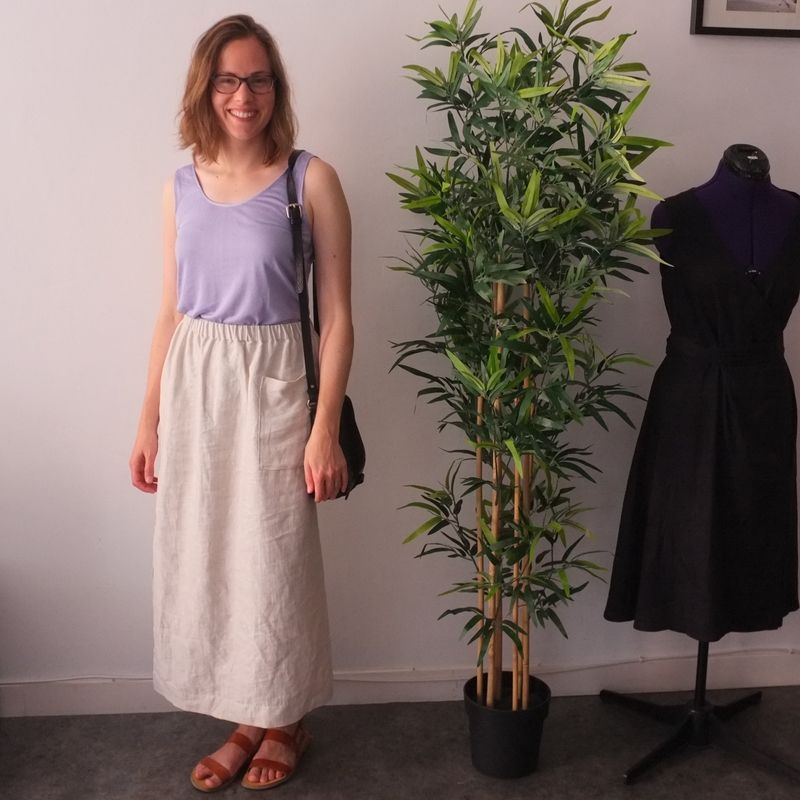 Day 2: thrifted lilac tank and self-drafted natural linen skirt (unblogged). I love the colour scheme in this outfit, so summery! Apparently lilac is the new millennial pink (thanks Katie for letting us know) and I can see why. I went from a slight aversion towards anything purple to being obsessed within a couple of days. I’m already planning to add more of this colour to my wardrobe. 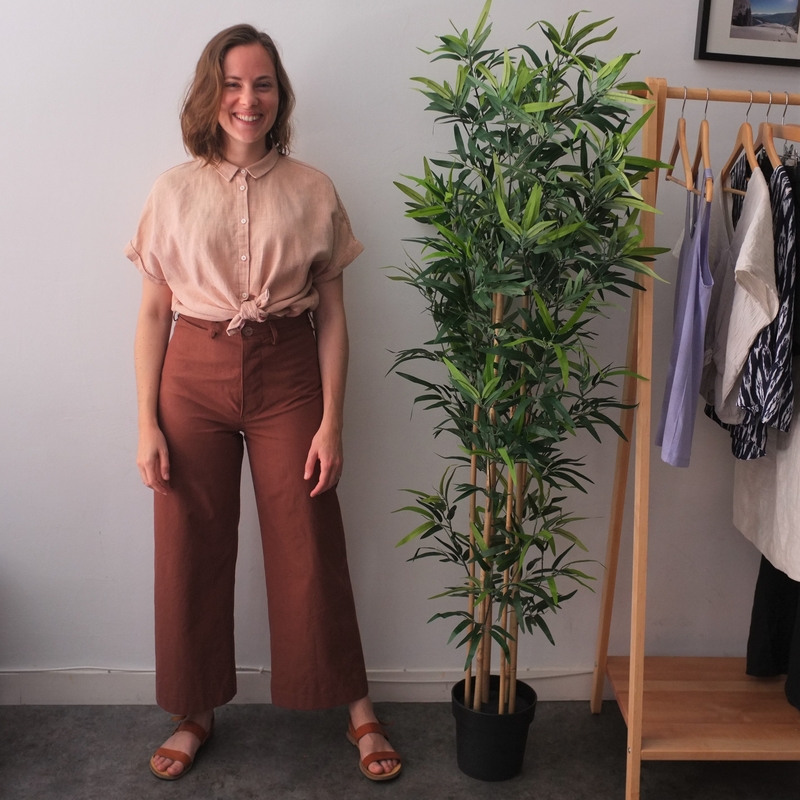 Day 3: Blaire Shirt and Persephone Pants. 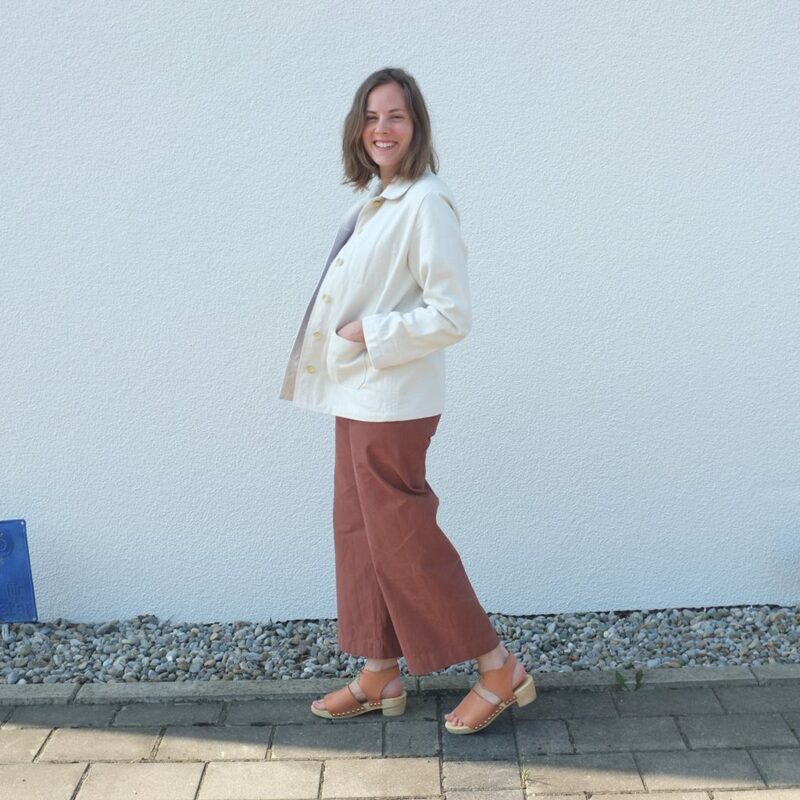 All the earthy colours in one outfit. This was an Instagram favourite and I agree, it’s a great colour combination. In terms of sewing patterns these two are absolute favourites, I love sewing and wearing them! 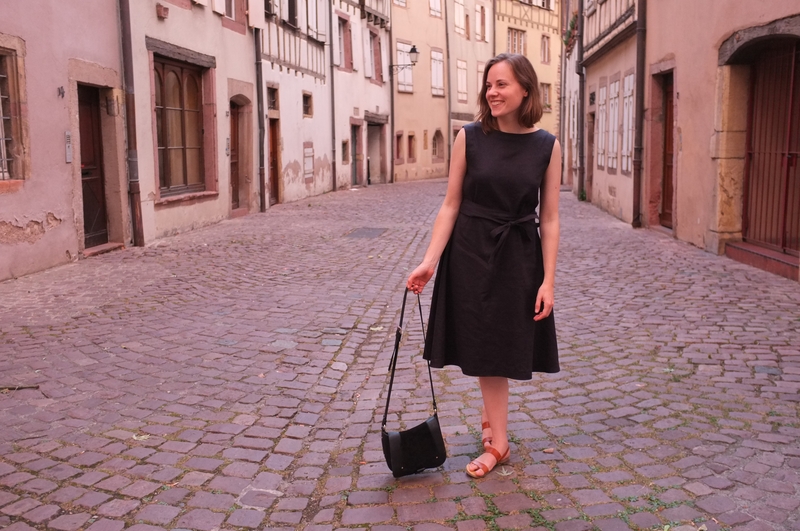 Day 4: thrifted and altered black linen dress. Already a favourite from last year and I’m really enjoying wearing it this summer too. 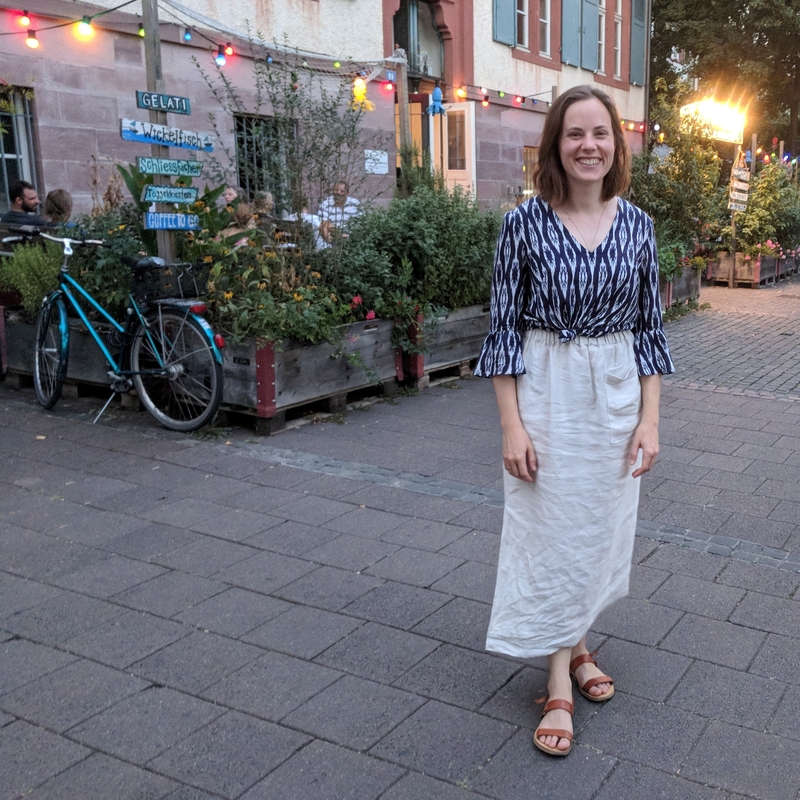 Day 6: Megan Nielsen Dove Blouse and self-drafted skirt for a trip to Basel for the Swiss national holiday. This skirts turns out to be exactly the summer skirt I needed. It was perfect for people watching by the river and strolling through the city. 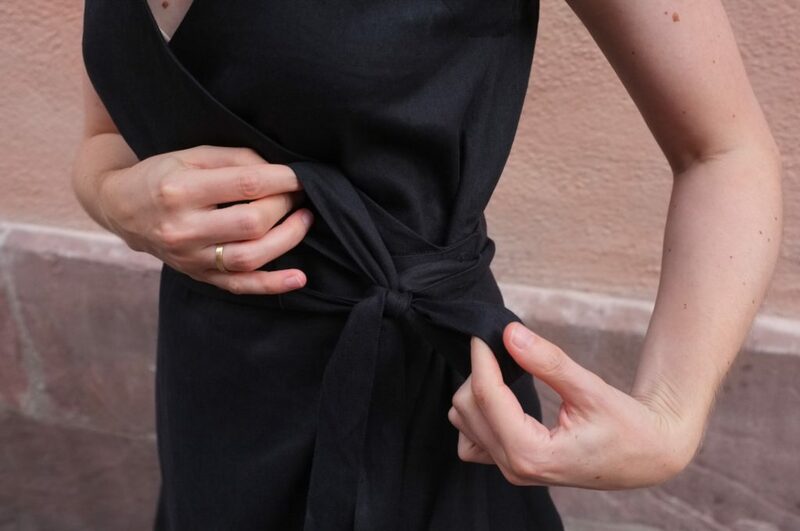 Day 7: Allie Olson Highlands Wrap Dress. 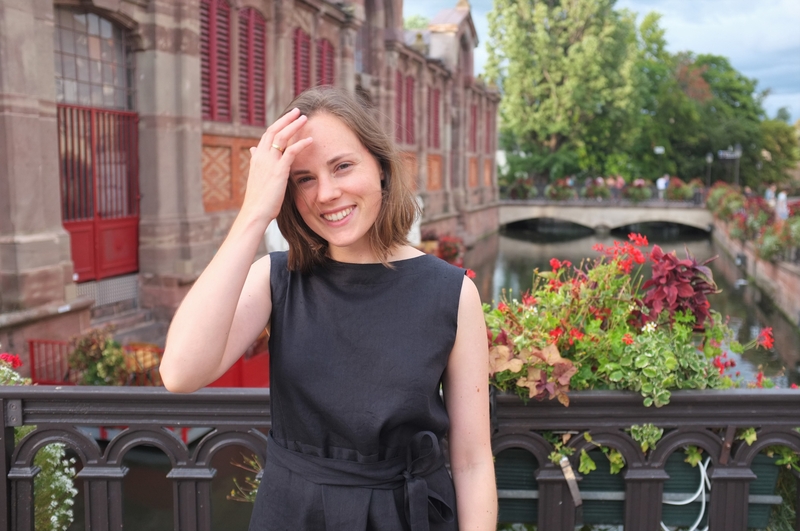 This was not on my original list of 10 pieces, but I realised that it would not be cool enough to actually wear my Tello jacket, so I swapped it with this dress for a dinner out. 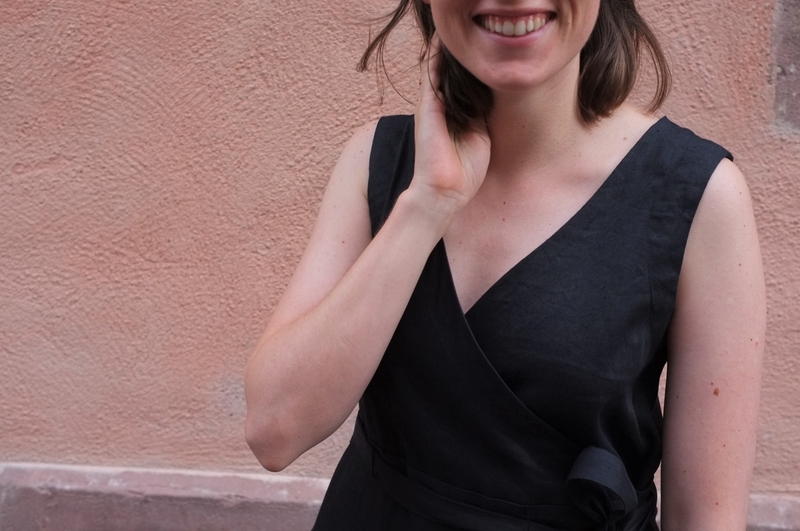 I love this dress and am glad that with the summer we are having and our life in France I have more opportunities to wear it out. Day 8: Megan Nielsen Dove Blouse and Peppermint Magazine Spring Shorts. 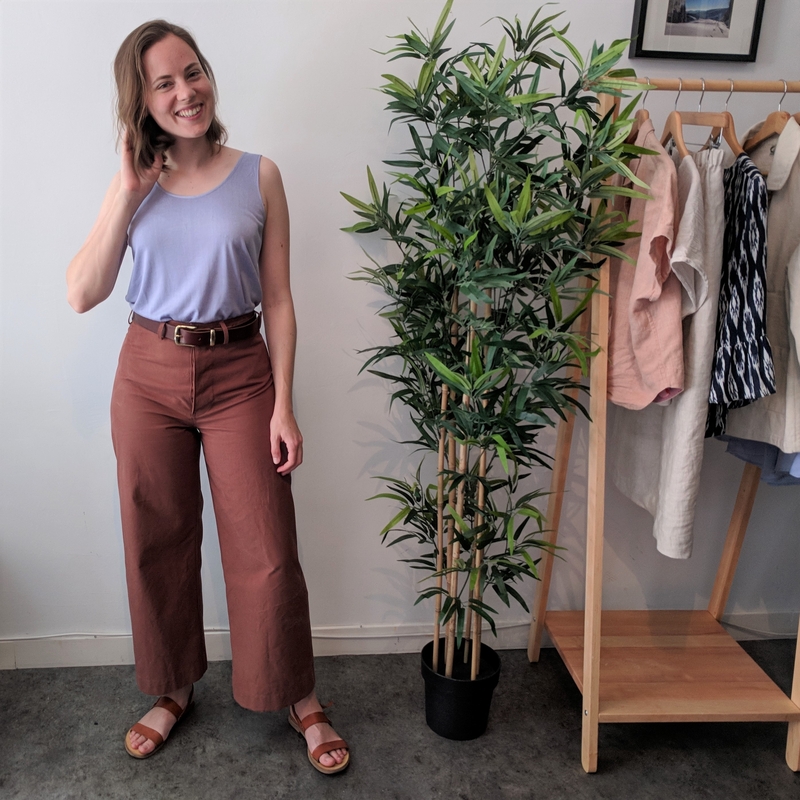 An easy breezy outfit, trying to combat the heat. 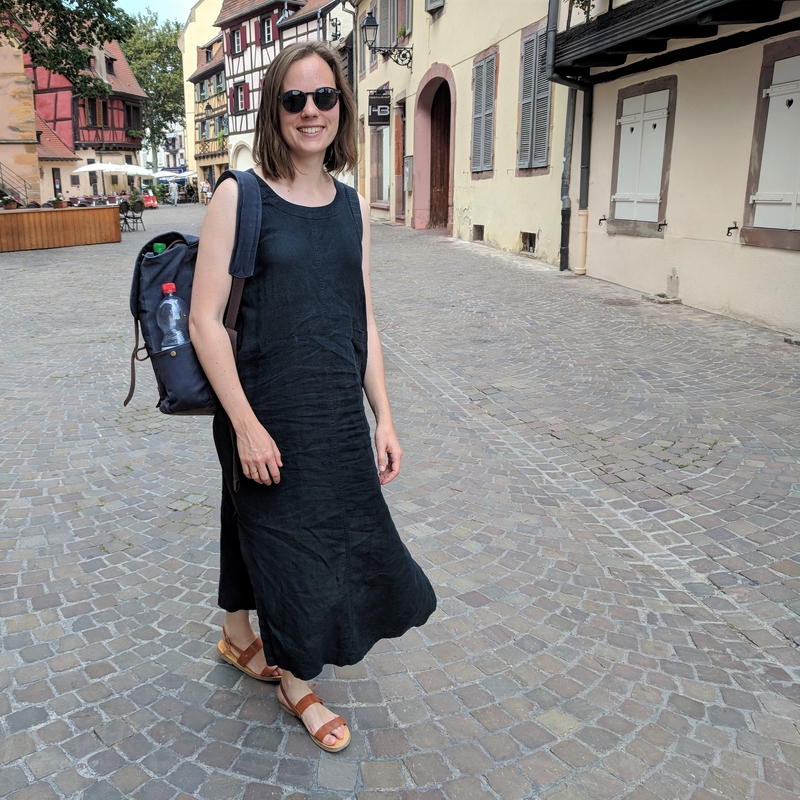 Day 9: thrifted linen dress (again) for a trip to Freiburg. 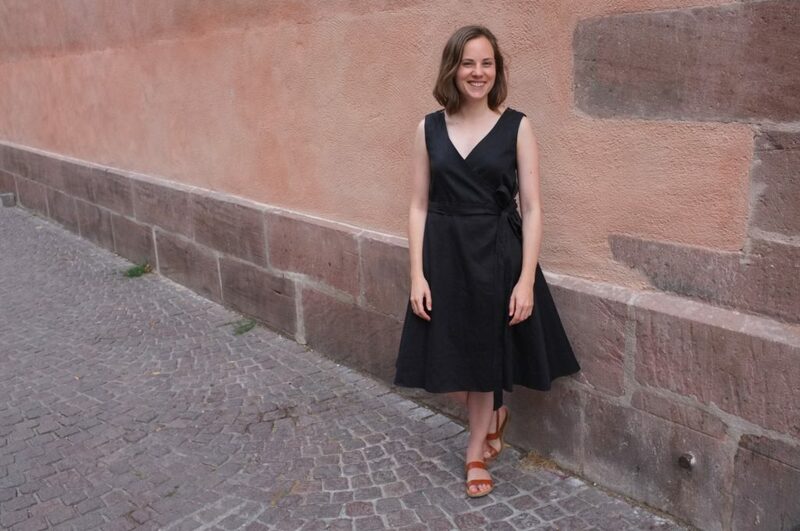 Again this dress has proven to be the perfect dress for very hot days. 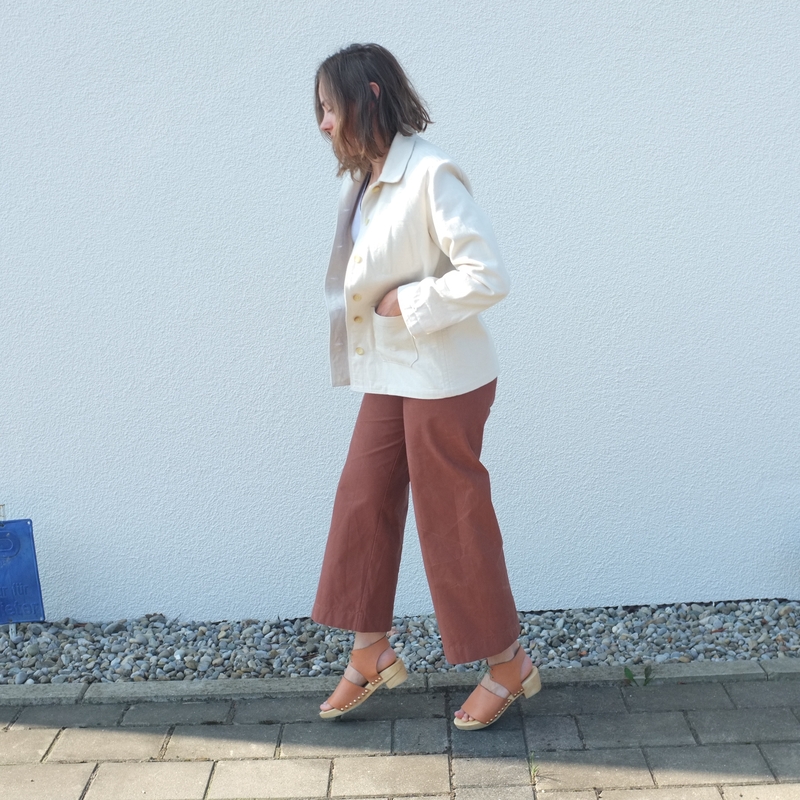 The long skirt with the slits creates a breeze when walking and it’s linen and so loose it barely touches my skin. Day 10: thrifted tank and Persephone Pants. This was one of the colour combinations I’d been most excited to wear. In the end it was too hot to really wear this outfit the whole day but I am keeping it in mind for cooler days. To switch things up I am wearing this outfit with a belt I just made. 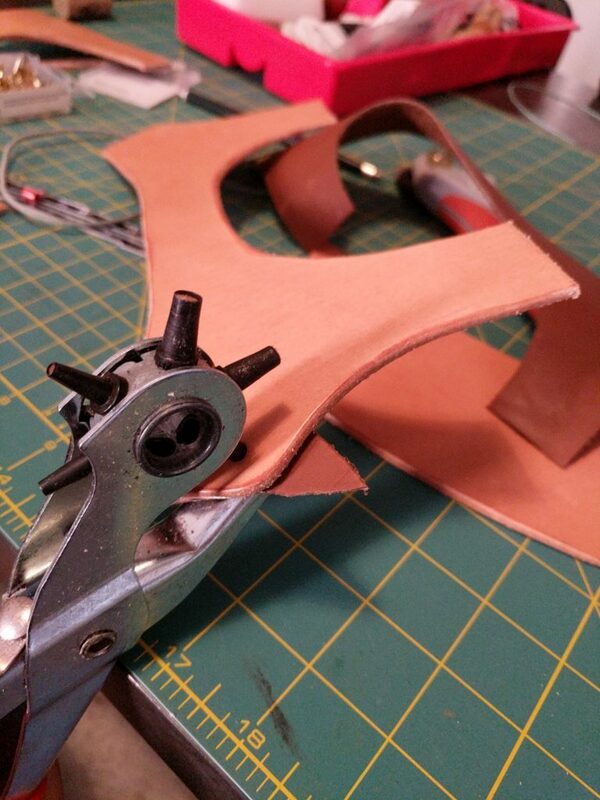 I haven’t worn belts in ages (not really necessary if you sew your own trousers and they fit properly) but since my husband and I have taken up leather working, I decided to make one for myself. I’m still getting used to wearing a belt, but I’m excited to try out some different styles. So what are the lessons learned from this little challenge? I love the colour palette I chose and instead of getting sick of wearing the same colours I am only more obsessed with them. I feel I need to add even more brown, orange and lilac to my wardrobe. Taking daily pictures indoors is hard. Our flat only gets little direct sunlight and we are facing a church with pink walls, which makes it very difficult to get clean pictures. I really need to improve my photography and picture editing skills! I am bad at accessorising. I tried to make an effort to accessorise more, but I really struggled. 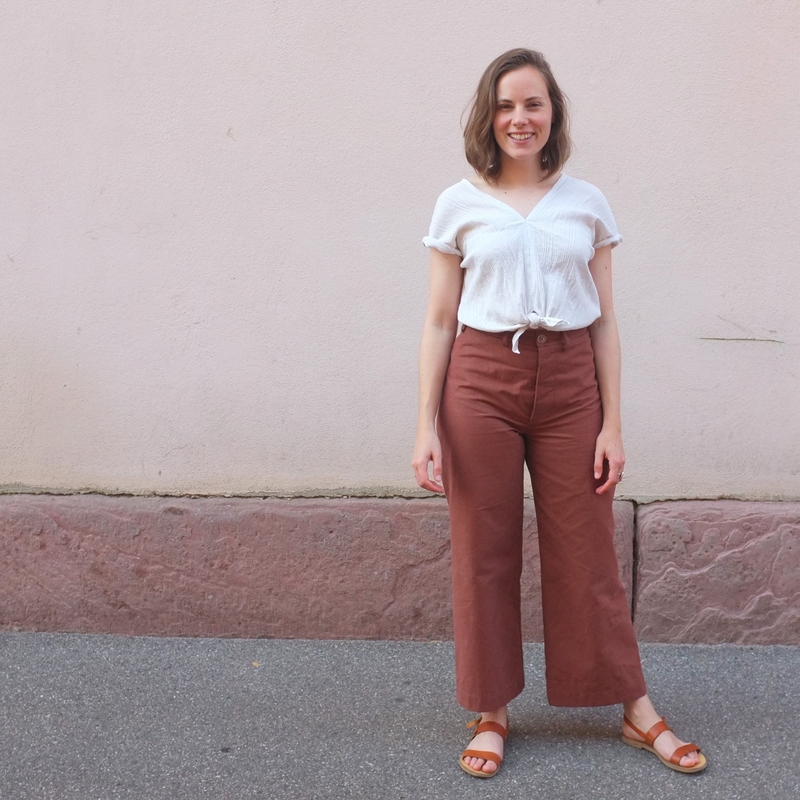 I just like simple, unfussy outfits (and don’t even own that many accessories). I do want to try and get better at this in the future as I find that the right accessories make a look feel more intentional. I’m planning on making/buying some minimalist pieces that fit my aesthetic. I don’t mind wearing the same shoes every single day. These sandals are so versatile! I will need to add some more summer shoes to my collection though, otherwise these will be worn out by the end of the summer. 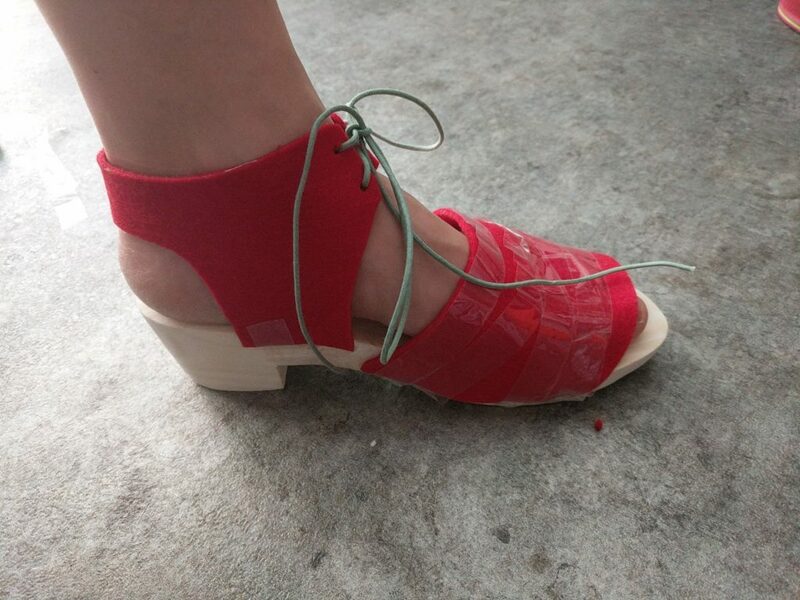 I’m currently working on my shoe-making skills, which is very exciting! 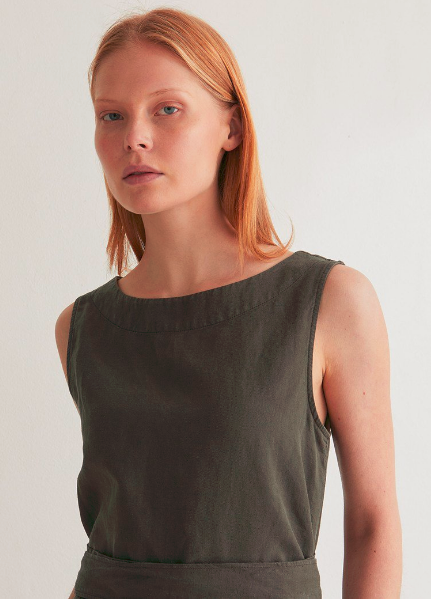 Most difficult item to combine: the Dove blouse. While I love it on its own, it had a different vibe than the rest of the wardrobe so it felt slightly out of place. Most favourite outfit to wear: anything that included my Persephone Pants. So that’s it. All in all a very successful experiment. I stuck to my 10 pieces and didn’t mind that I was limited in what I could wear. I love the idea of a small, mix-and-match wardrobe. I am conscious though that summer has made things very easy as no layering was necessary. I’m not sure I would have had the same success in winter, maybe I’ll join the winter edition, to really challenge myself. 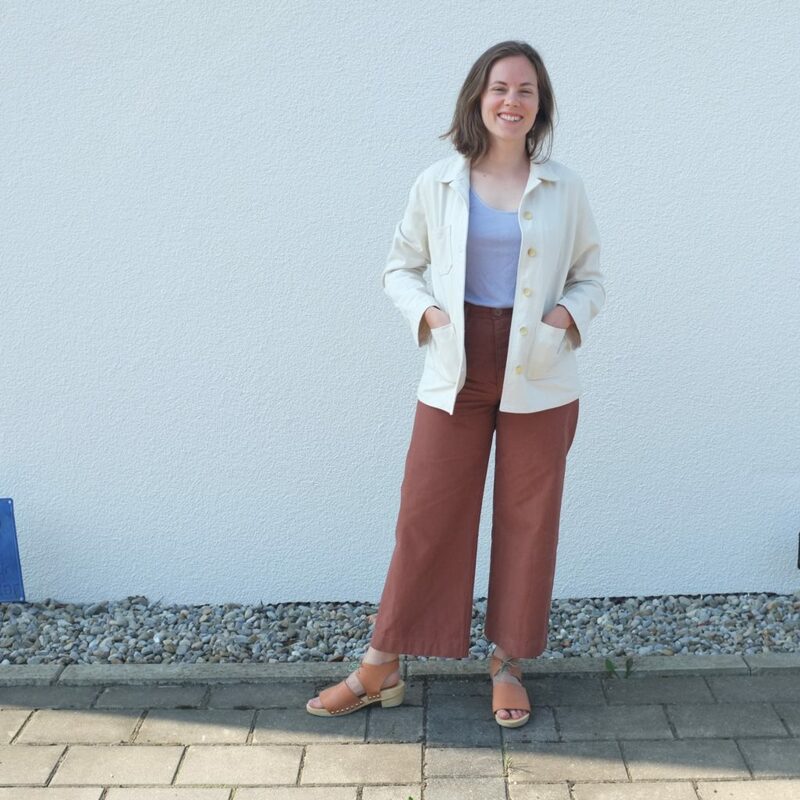 I’m still figuring out my new style, but it becomes increasingly clear to me what silhouettes, colours and fabrics work for me (loose silhouettes and all the linen!) and which don’t . This should make planning future projects a lot easier. The only issue now is that I am so inspired and have so many project ideas that I don’t even know where to start!